If you’re a majority Chrome browser user in Mac OS X you’ve probably noticed that when printing from the web browser, a custom print preview window opens up that looks quite different from the default print window on a Mac. 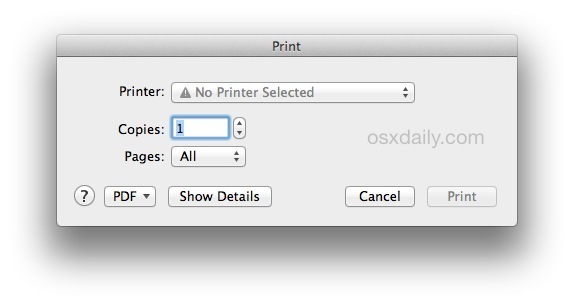 Some users may like the alternate Chrome print preview option with it’s larger viewport and different options, but if you prefer the general default MacOS X print dialog window, you can use a defaults command string to modify the behavior of Chrome to use the broader Mac system default printer window instead. 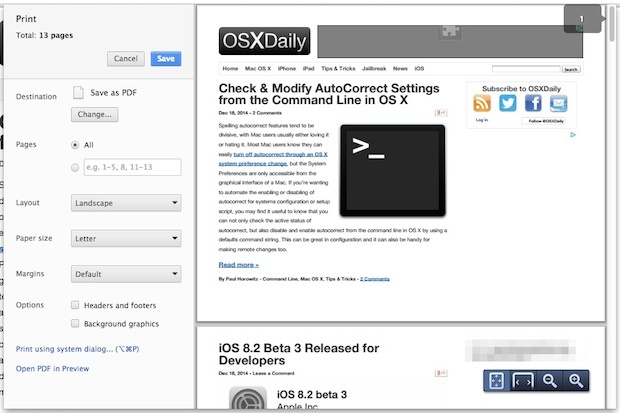 Making this change is only going to impact the print preview window when summoned directly from the Chrome web browser, changing it from the Chrome version to the same version seen elsewhere on the Mac when printing anything, this defaults string has no effect on anything else in Mac OS X. Outside of keeping things consistent, one of the perks of using the general OS X print dialog window is a return of the easy printing to a PDF file option right in the print window, though that should work fine without this if you enabled a keyboard shortcut for that purpose. Again you’d want to relaunch the Google Chrome app in OS X to have the change carry over. Another very nice hint/suggestion… Thanks! The Chrome print allows you to skip pages that don’t need printing,i.e., print pages 1-2,5, 7-8. The Mac print option doesn’t allow this. Correct me if I’m incorrect. Not a regular user of Terminal, but instructions were clear enough and I followed them. After exiting Terminal, I closed and relaunched Chrome. When I then went to print, the same Chrome window as before appeared. Update: Just realized my error. The Terminal command line is meant to include an empty space after “Preview” and before “-bool”. Perhaps the problem was just on my end as a result of my type-size preferences Chrome, but when it comes to publishing Terminal commands, it’s probably a good idea to put everything in a single line. For me, the command broke into two lines. Clearly, precision matters in Terminal! Hoping I didn’t inadvertently goof up anything with my failed attempts. Thanks. You’re right, of course — but watch out: you’ll be labeled a “pedant” for observing the most basic rules of grammar and punctuation, and correcting others who don’t. Language is a beautiful thing. It deserves our respect — which means making the effort to use it correctly, and stop using the “typo” excuse as a cover for ignorance and / or neglect. Is there a way to get the print preview to show in the mac OS print dialog from Chrome? I usually condense pages I print down to one page before I print, but without the print preview I can’t see what size % to print.